Wednesday's soccer exhibition at Fenway Park was about more than just bragging rights, this was a pure celebration of the sport at one of America's most famous stadiums. 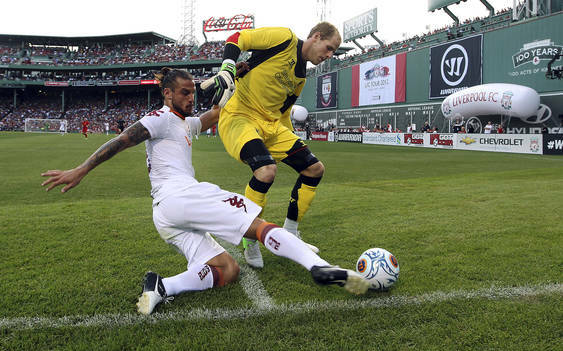 A new soccer record crowd inside Fenway of 37,169 watched AS Roma beat Liverpool 3-2, but it was the sport of soccer that was the real winner. The previous soccer record was set during the last game in 2010, when 32,162 fans watched Celtic FC top Sporting on penalty kicks after a 1-1 regulation tie. Wednesday's game became the 20th time soccer was played at Fenway. Back in 1968, Pele made an appearance at Fenway, when Brazil's Santos F.C. played the Boston Beacons of the North American Soccer League in an exhibition game. It is no surprise that the Beacons lost 7-1. Although this year's game received an immediate buzz when it was announced months ago, the brilliant marketing efforts of ESPN helped greatly on the TV-side. In 2010 the game was produced live by NESN, and simulcasted nationally on Fox Soccer Channel, with beloved broadcaster Jack Edwards calling the event. While that game was successful, at the time Fox Soccer Channel was only distributed to 36 million U.S. households. Wednesday's game was televised live on ESPN2, unfortunately without the call of Edwards, which is distributed to 98 million U.S. households. This was a significant improvement for the publicity and viewership of the Fenway event. As the event will be remembered as a success, hopefully this promotes future soccer games at Fenway Park. Just as too many hockey games at Fenway would take away from the excitement, too many soccer games would be just as damaging. But one appearance a year would make for a special event at the stadium, and a Revolution appearance would be even better. Fortunately for soccer, the future looks bright at Fenway.